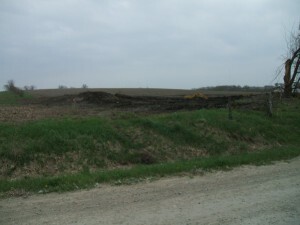 Herbert Site – French-Reneker-Associates, Inc. The Herbert site was a 12-acre site in Mahaska County. The project included about 50,000 cubic yards of excavation, and controlled general fill to backfill several sink holes from underground mines. The site was severed by a deep gully that was shaped into a grassed waterway. This project was constructed in 2008. The seeding came on quite quickly on this site, and at this time, five years later, there is no evidence of erosion. The landowner has taken good care of this project by applying additional fertilizer, lime, and seed through the years. The landowner could not be happier with this project.